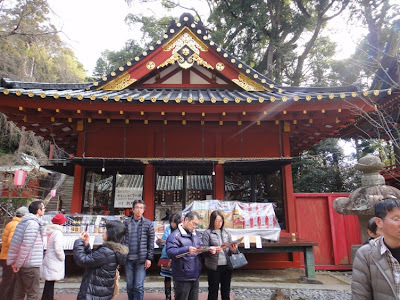 On 4th January, hubby and I visited Kunozan Toshogu Shrine in the city of Shizuoka in Shizuoka prefecture. The shrine is located near the top of Mount Kuno in Suruga Ward of the city. 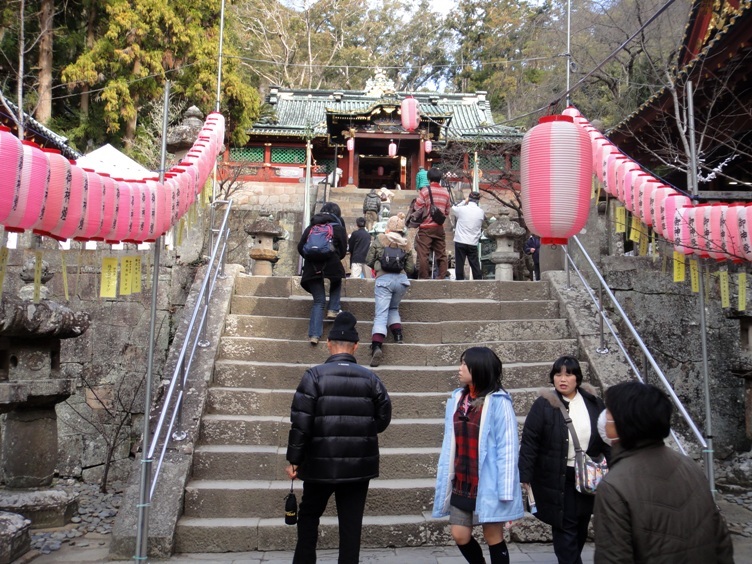 We climbed 1159 stone steps up the walkway from the foot of the mountain to the top in about an hour. As I wrote in the previous post, the climb up the 216-meter-high steep mountain was a bit tiring but we were rewarded with magnificent views during the climb. Kunozan Toshogu Shrine is dedicated to Tokugawa Ieyasu who was the first Shogun of Tokugawa Shogunate. The shrine is located at the top of Mount Kuno and was the original burial place of Ieyasu. The mountain was the site of a Buddhist temple named Kunoji, which dated to at least the early Nara period. 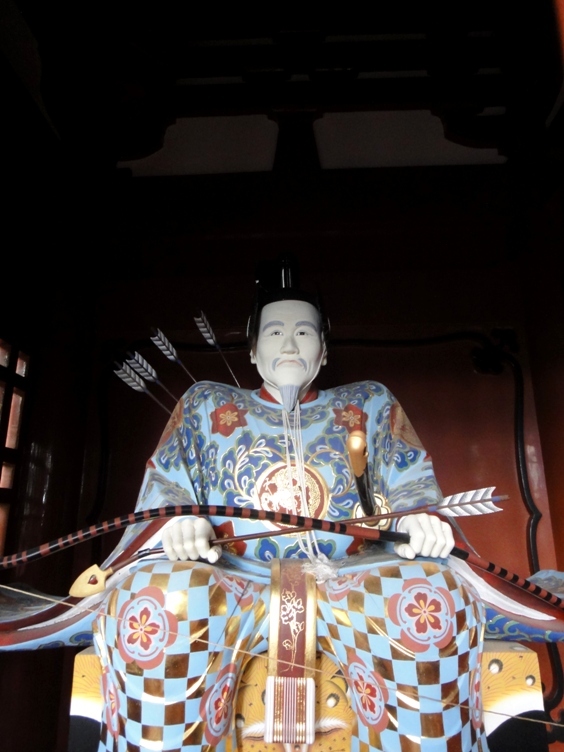 In 1568, a feudal warlord named Takeda Shingen moved the temple to a nearby place that is now called Shimizu-ku, and built a castle on Mount Kuno. 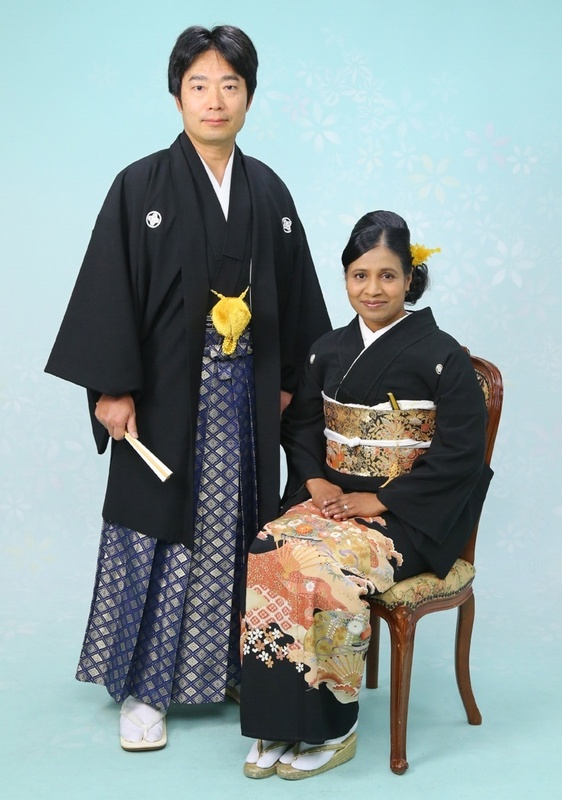 In 1582, Takeda clan was defeated by Tokugawa Ieyasu and Suruga province along with Kuno Castle came under the control of Tokugawa clan. 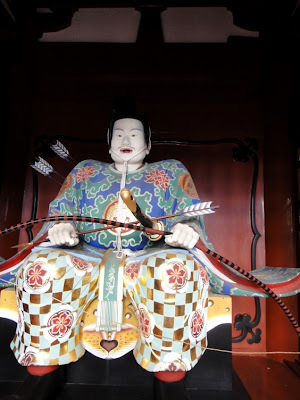 Ieyasu formed Edo Government in 1603 and then retired to a nearby Sunpu Castle in 1607. 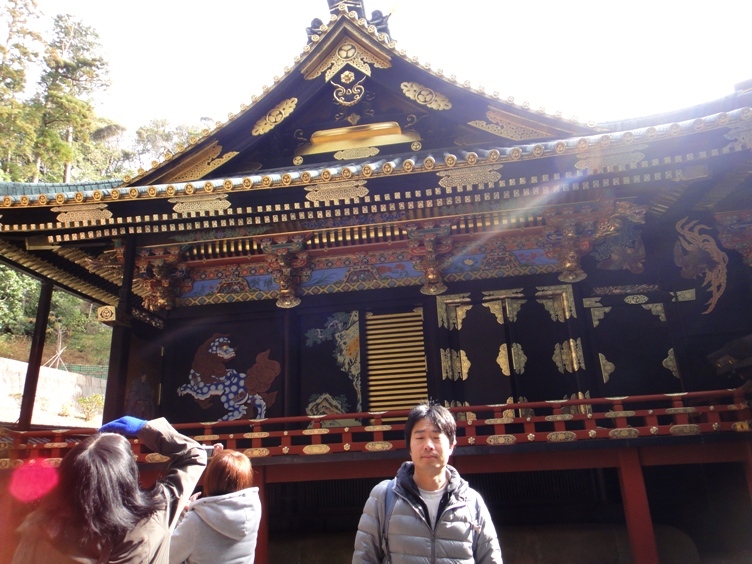 However, he considered Kuno Castle to be important and so he continued to maintain the castle. 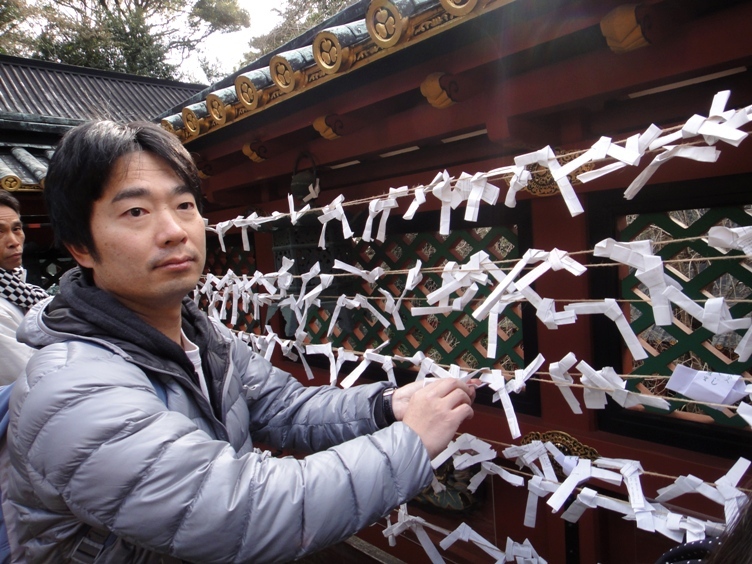 He wished to be buried at the top of Mount Kuno, and therefore as per his wishes he was buried at the mountaintop after his death in 1616. In 1617, Tokugawa Hidetada, second Shogun and son of Ieyasu, built Kunozan Toshogu Shrine as a mausoleum of Ieyasu at the site of Kuno Castle. 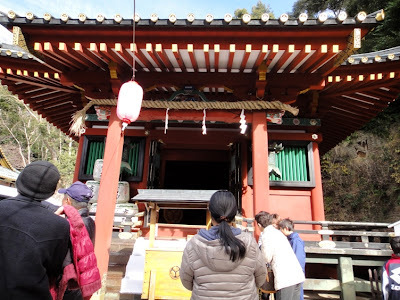 At the first anniversary of Ieyasu’s death, his grave was relocated to Nikko in Shimotsuke province (present Tochigi prefecture) where a shrine with the same name as Toshogu was built and Ieyasu was deified by the third Shogun Tokugawa Iemitsu. 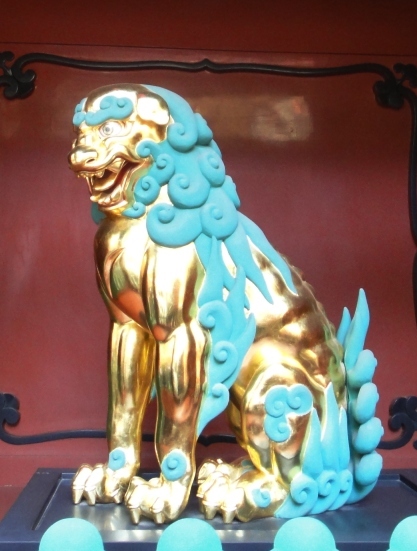 However a portion of his deified spirit is said to still reside on Mount Kuno. 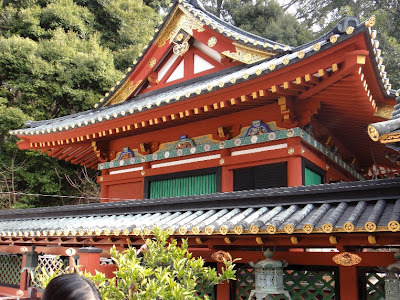 Kunozan Toshogu Shrine was originally built in the mixed style of Buddhism and Shintoism. 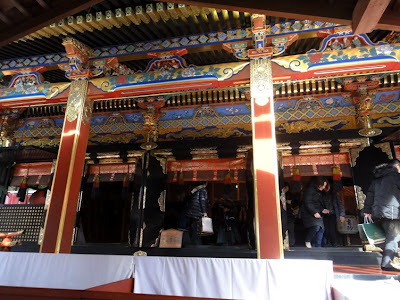 After the Meiji Government overthrew the Tokugawa Shogunate, and the subsequent separation of the two religions, some of the Buddhist structures were removed or remodeled. 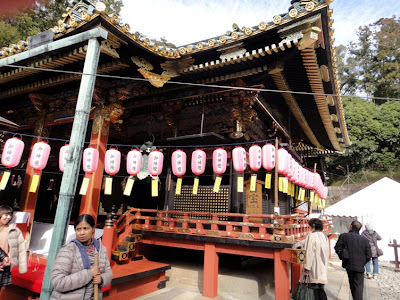 The primary enshrined kami (god) at this shrine is Tosho-Daigongen which is the deified spirit of Tokugawa Ieyasu. 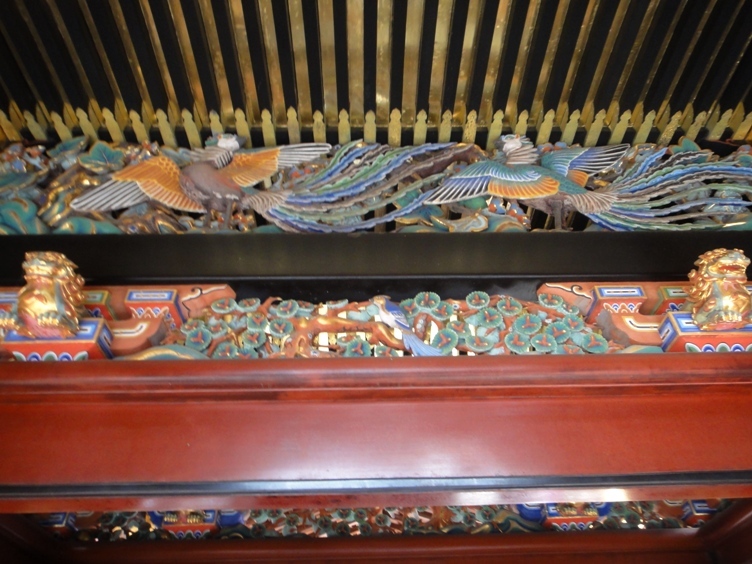 From Meiji period, two secondary kami, the spirits of Toyotomi Hideyoshi and Oda Nobunaga are also enshrined here. 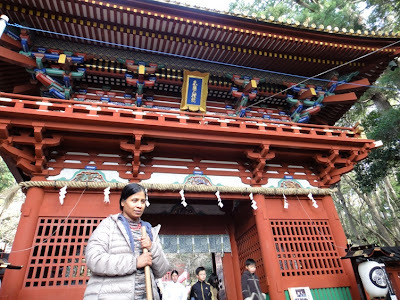 Presently the sacred grounds of the shrine complex consist of thirteen gorgeous structures and all of them are original. All these structures are bright red buildings decorated with gold accents and colorful carvings and paintings. 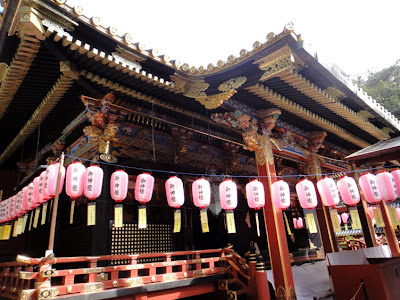 The buildings named Honden, Haiden, and Ishinoma are designated as national treasures. All other buildings are designated as important cultural properties. 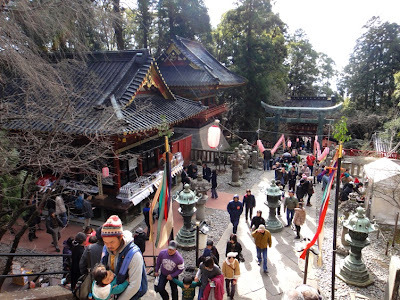 This shrine is the oldest of all the Toshogu shrines. As I wrote in the previous post, hubby and I climbed up the walkway from the base of Mount Kuno and took about an hour to reach near the top of the mountain where the shrine is located. 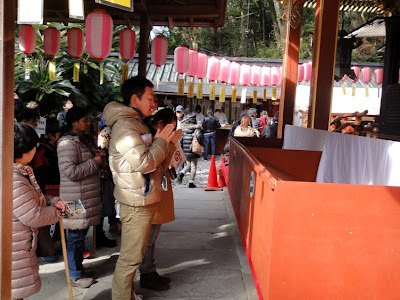 Adjacent to the souvenir shops and food stalls at the mountaintop, there is a ticket counter from where we bought tickets worth 500 Yen per person to enter the sacred grounds of the shrine. From the ticket booth area we could see Romon Gate of the shrine. 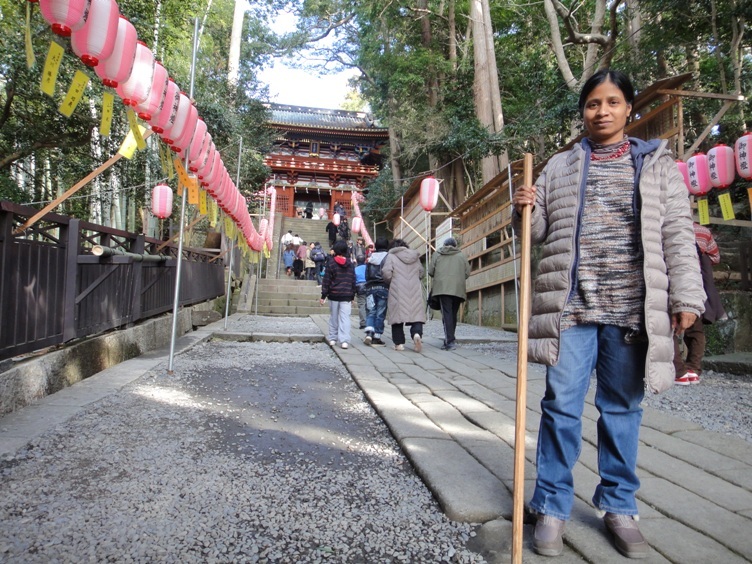 Romon Gate is gorgeous and delimits the shrine premises. 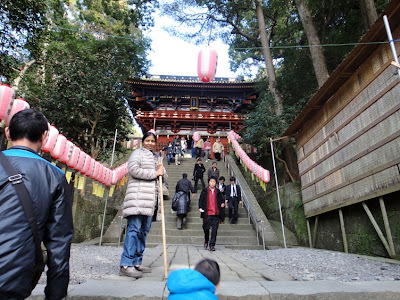 We climbed several stone steps and reached near the gate which is an elaborate wooden red colored structure decorated with gold accents and colorful carvings and paintings. It is said that the name of the shrine written on the beautiful framed plaque hanging from the second floor of this gate building was carved by Emperor Go-mizunoo himself. 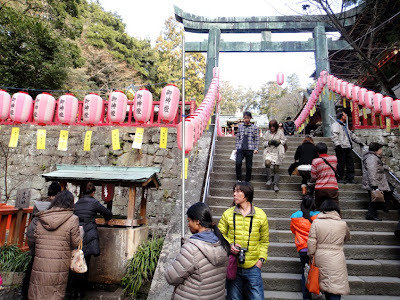 This gate is designated as an important cultural property. On reaching the gate, we saw that two wooden statues of Zuijin warrior guardians armed with bows and arrows are located on each side of the gate to protect the entrance and the grounds of this shrine from evil spirits. Zuijin were high-ranking court guardians to the nobles in Heian period. The statue on the right side of the gate is called Udaijin and the one on the left side is called Sadaijin. On entering inside the gate we saw a pair of golden and green colored guardian statues flanking the backside of the gate. 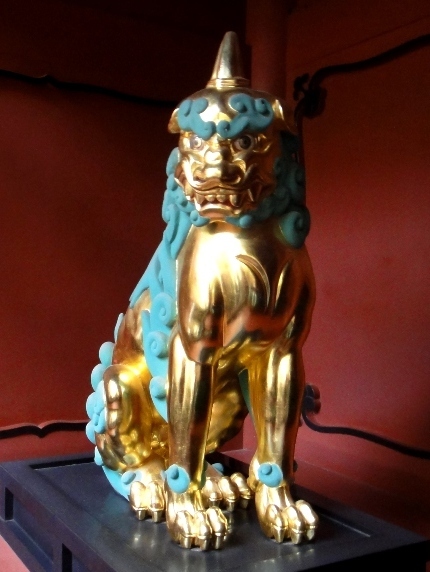 The statue on the right side of the gate (orientation from inside the sacred grounds) is called Ungyo Komainu and the one on the left side is called Agyo Shishi. We loved seeing the colorful gate and all the beautiful statues. 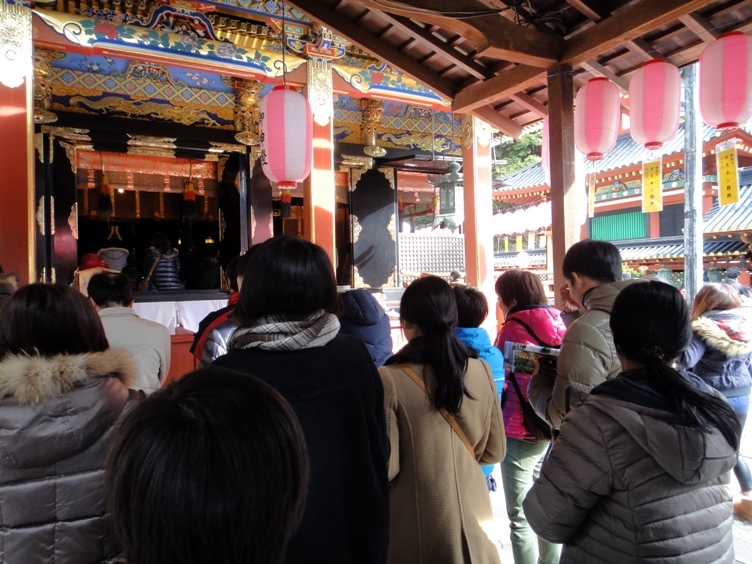 We walked along the walkway for several meters and saw Temizuya to our left. Temizuya is a hand washing basin with a roof supported by four pillars. 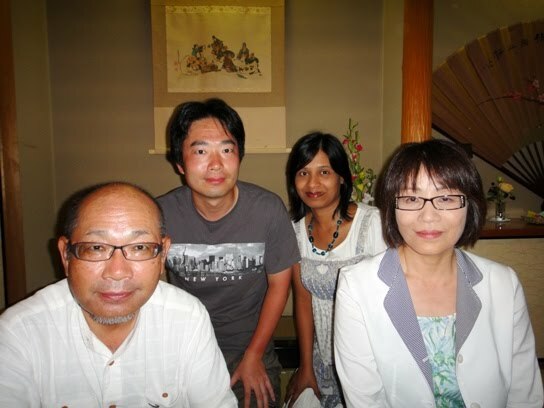 We washed our hands with water at the basin and purified ourselves. 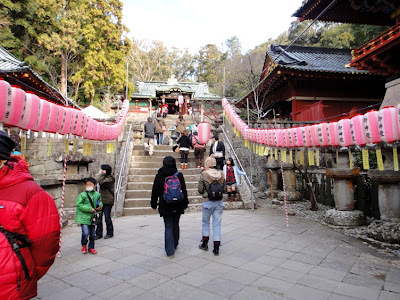 Then we climbed a few steps along the walkway and reached a stone Torii Gate. 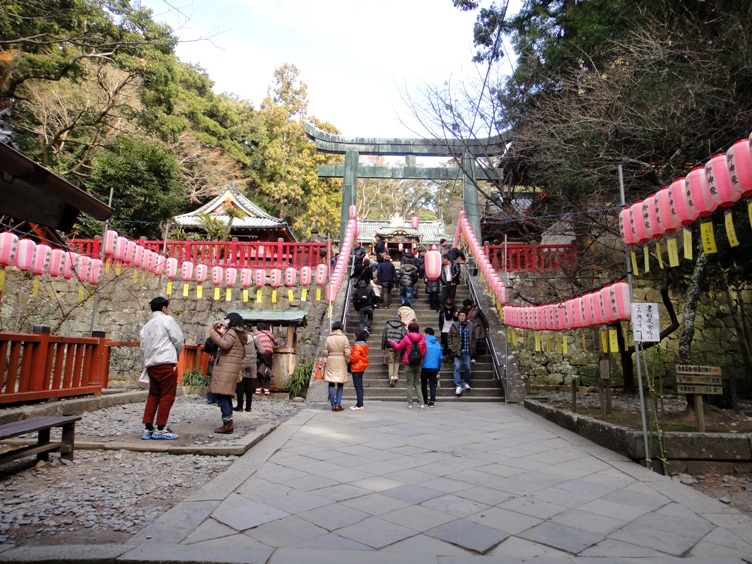 After crossing the Torii Gate, we walked along the walkway and saw a beautiful red building named Korou to our right side. 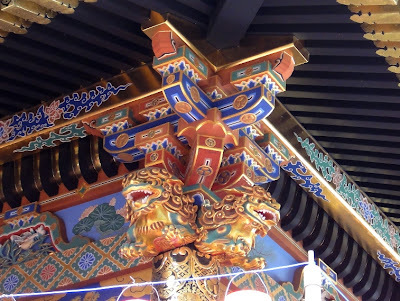 There are colorful carvings and gold accents on the ceiling and walls of this building. 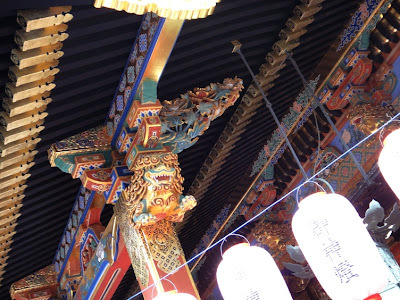 The building was originally a Buddhist structure that was used as a bell tower. 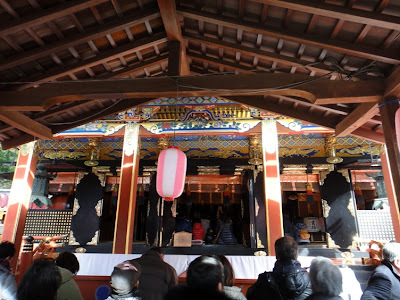 But during the Meiji period, it was remodeled as a Shinto structure and now holds Taiko drums. Korou is designated as an important cultural property. 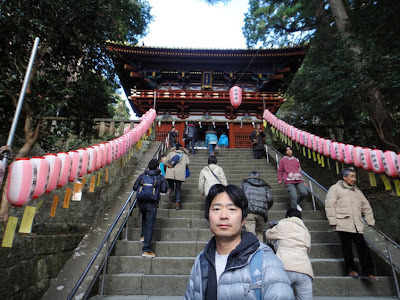 We climbed a few more steps along the walkway and then saw another red building named Kaguraden to our right side. 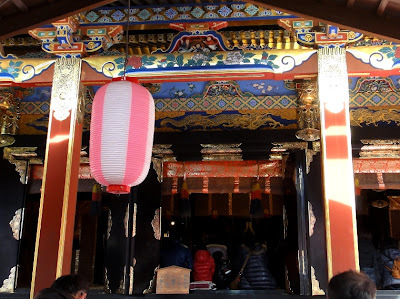 Although the name Kaguraden suggests that it is a building to hold Shinto theatrical dance named Kagura, no such performance takes place here. Presently people hang Ema wooden plaques inside this building. Kaguraden is designated as an important cultural property. 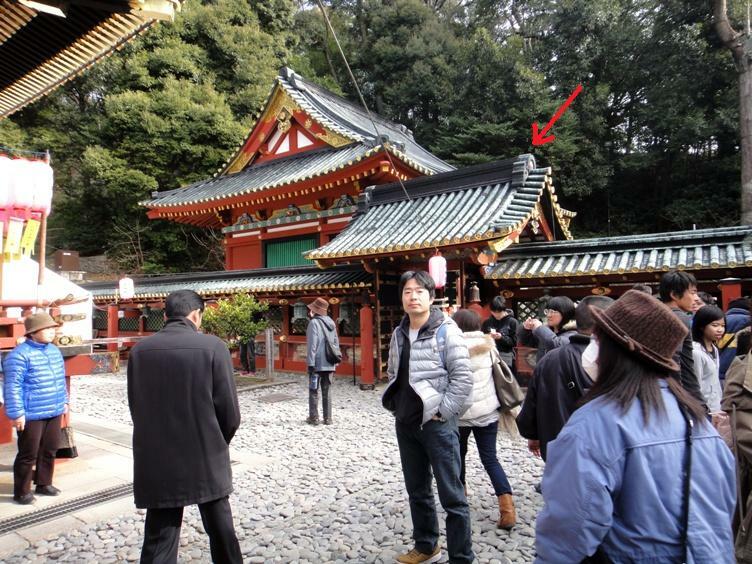 Hubby is standing on the walkway next to copper lanterns and appreciating Kaguraden (not seen). 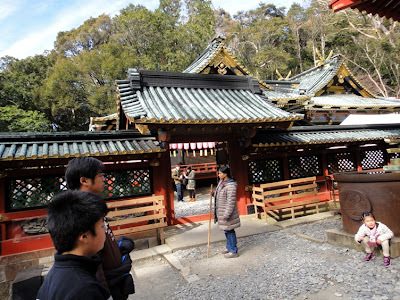 The next gate of the shrine is seen up the walkway. Next we climbed the last few stone steps along the walkway. While climbing these steps, we turned around to view and appreciate the shrine grounds where we saw many visitors who had come to offer Hatsumode prayers for the New Year celebrations. 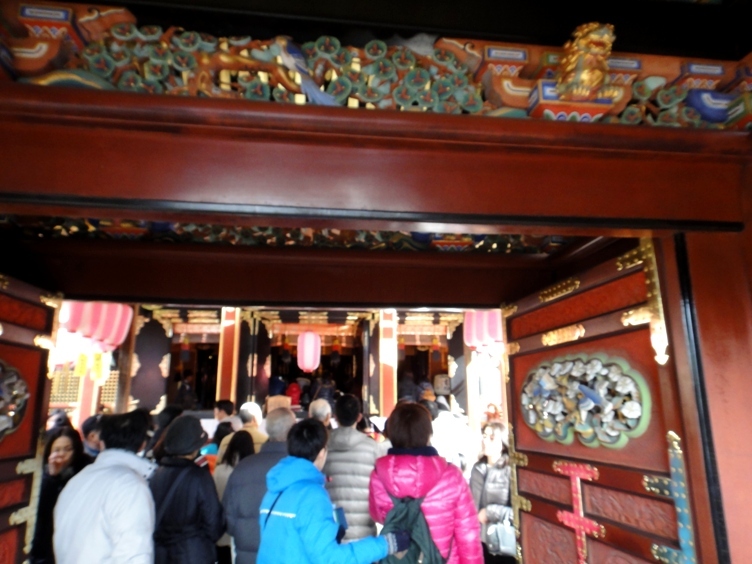 At the end of the walkway, we reached a gorgeous red colored gate with a magnificent roof. 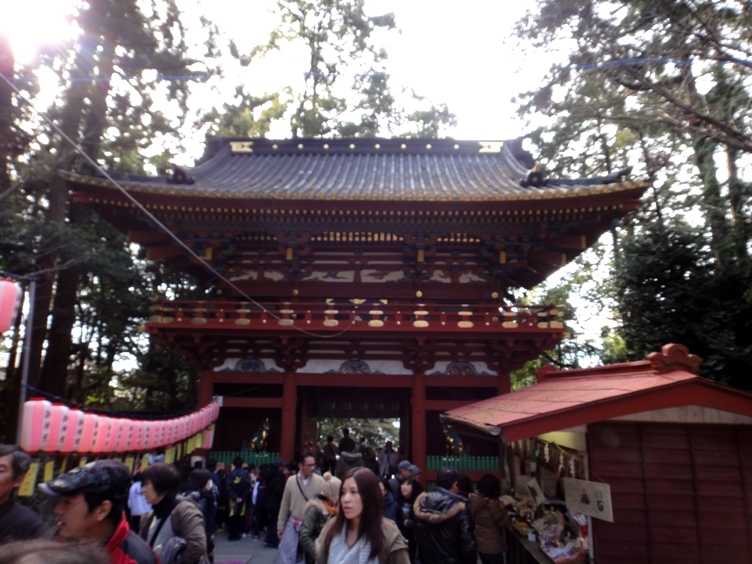 This gate named Karamon Gate is the entrance to the shrine hall named Haiden. 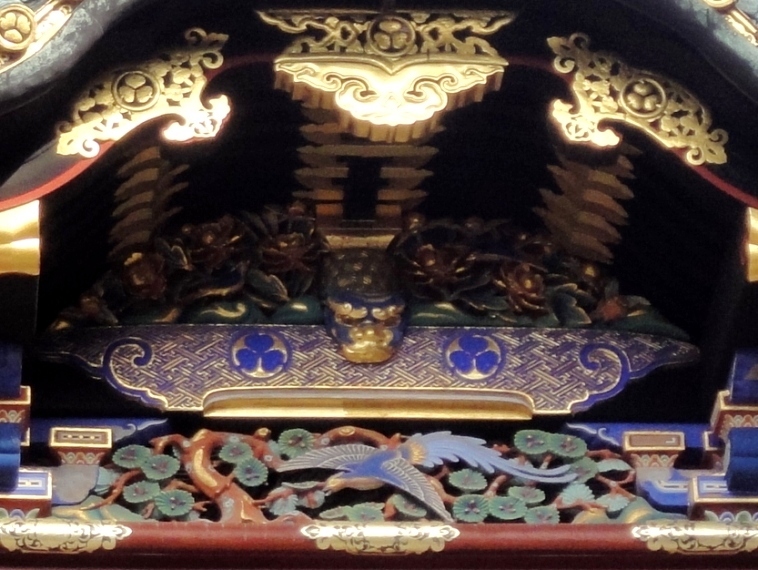 The gate has arched Chinese style roof with exquisite colorful wood carvings, gold accents, and painted decorations. 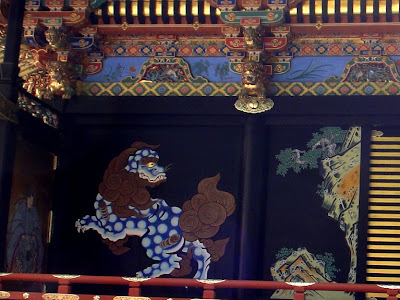 The gate has painted carvings of dragons, peacocks, mythical beasts, flowers, leaves, and many other interesting subjects. This colorful styled ornate gate is designated as an important cultural property. We took several photos of the gate from various positions and angles. 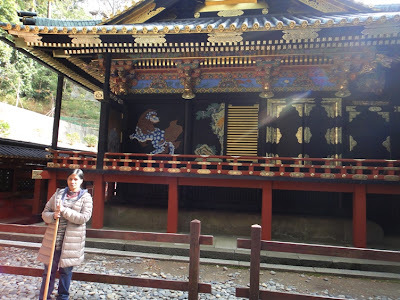 After passing through Karamon Gate, we reached a small praying area which is a roofed structure with no walls. This praying area is located right in front of the worship hall named Haiden Hall, and we could clearly see the ornate altar of the hall. 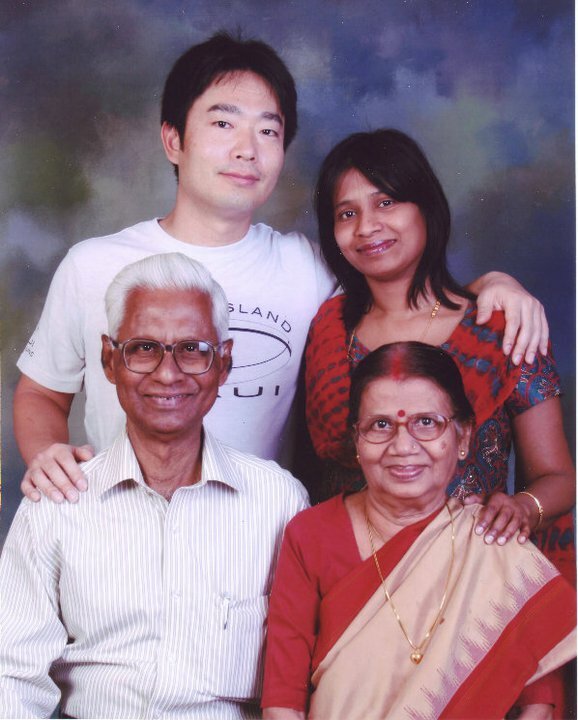 I offered some coins into the offertory box, clapped my hands twice, and prayed for the well being of my family as well as friends. Hubby compiled a video of me praying. I almost reached the front of the praying area and am ready to offer prayers. Huge offertory boxes are seen on the right side of the photo. Next we saw the main building named Shaden which is the focal point of the shrine. 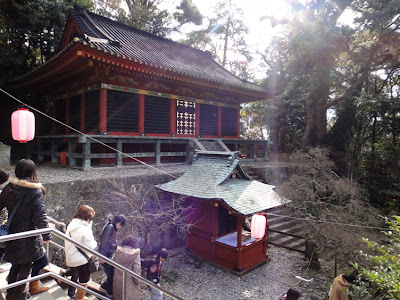 Shaden consists of three buildings named Honden Main Hall, Ishinoma Interconnecting Hall, and Haiden Worship Hall. Shaden is dedicated to Tokugawa Ieyasu, and was built by his son Tokugawa Hidetada in 1617. This main building is a fantastic wooden structure built by a famous carpenter named Nakai Masakiyo in just 19 months. The architectural design of this kind of building is known as Gongen-zukuri. At that time, this was the most advanced architectural technology. 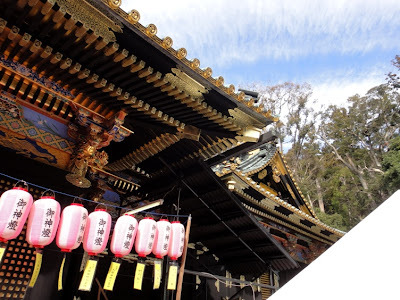 In fact, the Gongen-zukuri style of constructing the Shaden was established at this shrine, and therefore this shrine is the oldest of all the Toshogu shrines. 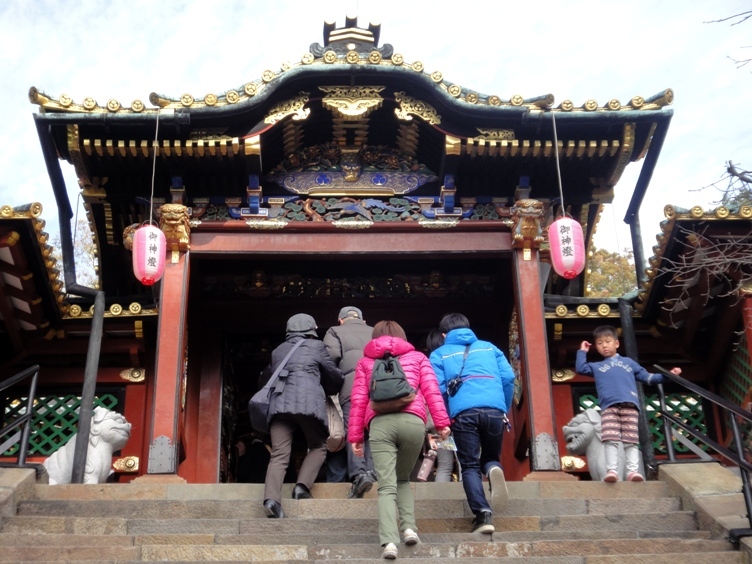 Later the same architectural style was adopted by other Toshogu shrines including the one at Nikko City. 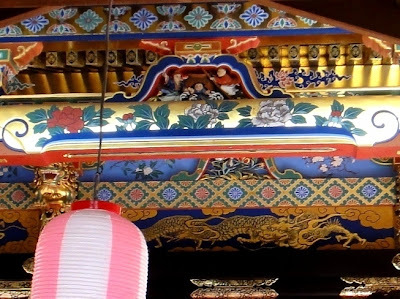 The Shaden building shows the flamboyant colorful style of the late Momoyama period, with extravagant wood carvings, gold leaf, and painted decorations over black lacquer. The primary enshrined god in Honden Main Hall is Tosho-Daigongen which is the deified spirit of Tokugawa Ieyasu. 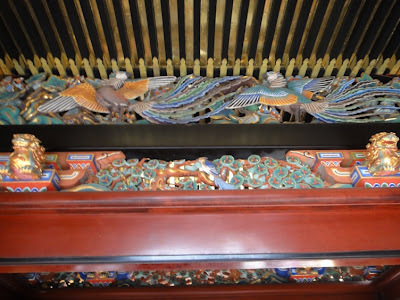 In addition, two secondary gods, the spirits of Toyotomi Hideyoshi and Oda Nobunaga are also enshrined. 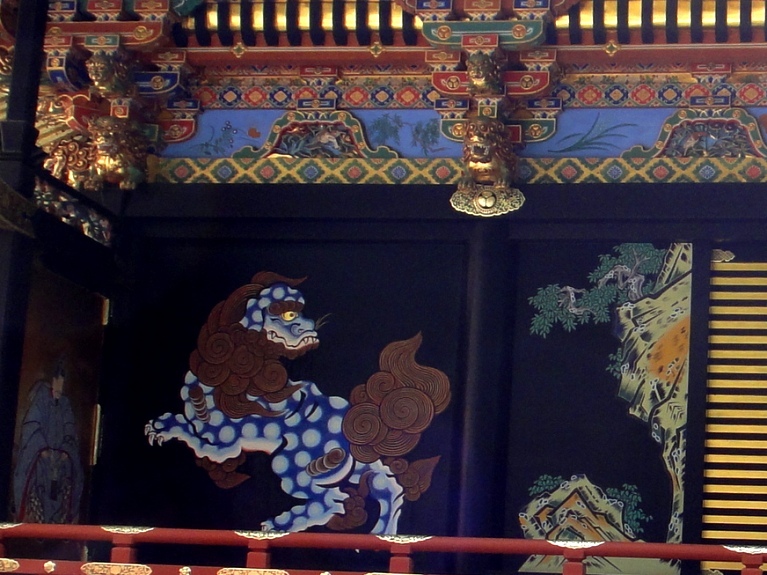 Honden, Haiden, and Ishinoma have been designated as national treasures in 2010. We loved viewing the Shaden building which is designed so beautifully and the details of the decorations are astounding. We took several photos of the building from various positions and angles. Afterwards we walked around in the sacred premises in front of the Shaden building and enjoyed viewing the building some more. Then we went to Omikuji fortune stall located adjacent to Shaden building, and paid 200 Yen to draw the fortune. 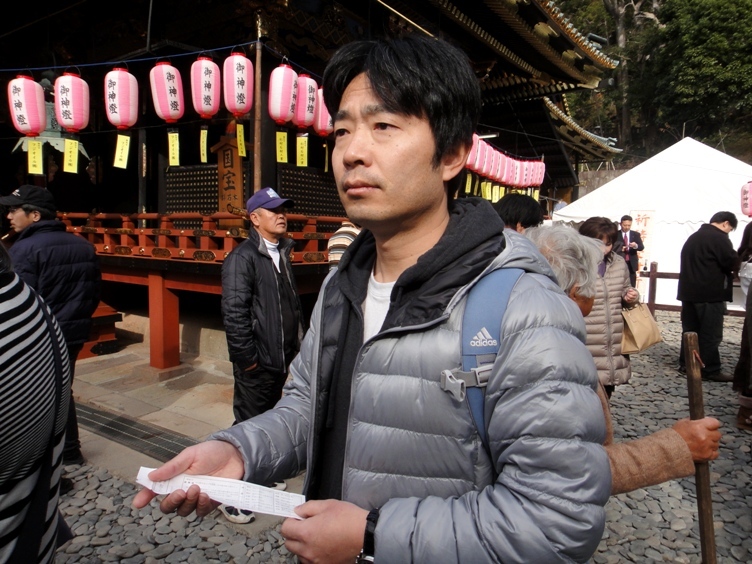 Omikuji are sacred random fortunes written on strips of paper. Both our strips of paper showed ‘normal luck and fortune’. 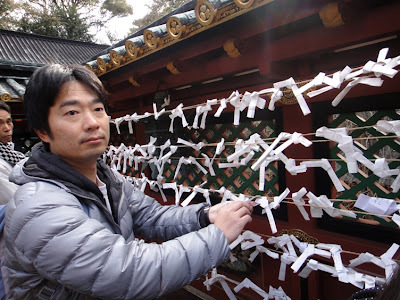 Later hubby tied the paper strips to a string on the frame set up at the shrine ground. Hubby is standing in the Shaden area of the shrine. The gate (indicated by red arrow) seen behind him is the side gate which can also be used to enter inside the Shaden area. Next we left the Shaden building area using the side gate located on the east side of the sacred premises, and saw a subsidiary red colored shrine named Hie Jinja right in front of us. 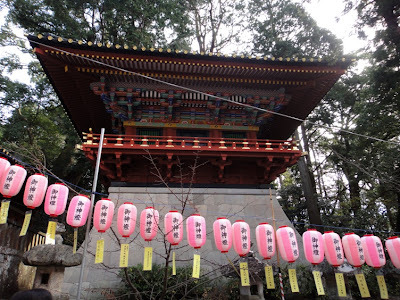 Hie Jinja is dedicated to Oyamakui-no-mikoto. 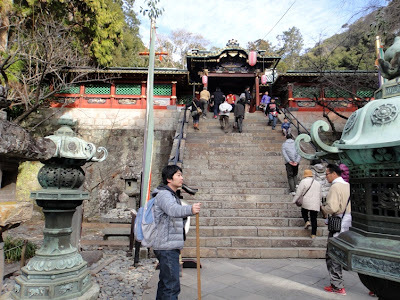 Earlier a statue of Yakushi Nyorai was enshrined here but during the Meiji period the statue was moved to a nearby temple named Daishoji Temple. Hie Jinja is designated as an Important cultural property. 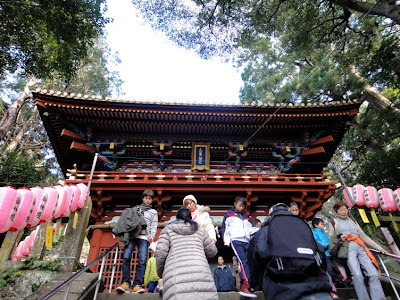 We walked down a few stone steps, and saw another red colored building named Shinko located to the southeast of Hie Jinja. Shinko building is constructed in Azekura-zukuri architectural style in the same way as Shosoin building located in Nara City. Shinko is a repository where products and artifacts dedicated to Kunozan Toshogu Shrine are stored. 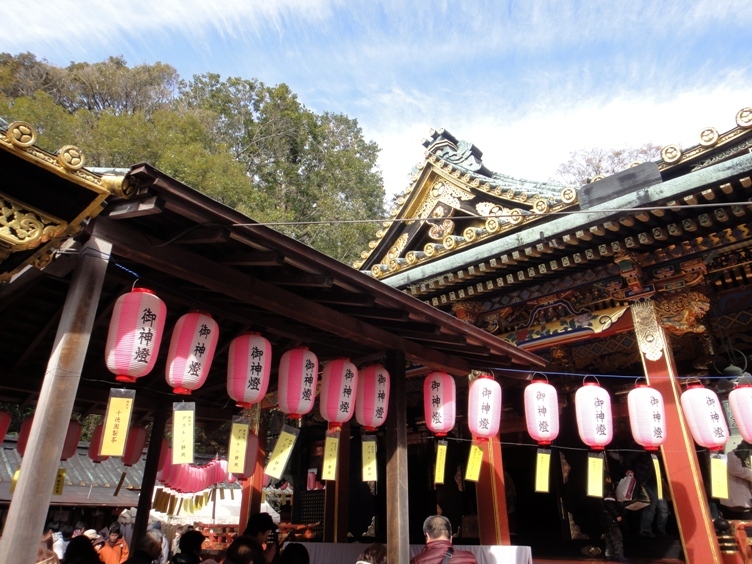 Shinko is designated an important cultural property. Later we went back inside the Shaden building sacred area and again viewed and appreciated various buildings of the premises. Afterwards we visited the mausoleum of Tokugawa Ieyasu located further up Mount Kuno. I will write about the Mausoleum in the next post.